Long before Bill Bryson wrote these words, thousands of the UK’s most talented, and often most wealthy students were applying to attend the city’s 600 year old, collegiate research university. Millions more tourists travel North to experience the city and its stunning World Heritage Site, Durham Cathedral, sited opposite Durham Castle, the university’s oldest college. Yet, while the city may be perceived as a wonderful, ancient seat of learning and spirituality, the ex-mining towns and villages across the wider county remain in the shadow of the recent demise of its coal and iron mining industry. A mining heritage that over the past four decades has seen the people of County Durham unite together as passionate political activists, to fight for their way of life, their pit village communities and their livelihoods, that for well over a hundred years had been earned down the pit. With the last iron and coal mine closed in 1994, due to the privatisation polices set down by Margaret Thatcher and her conservative government in 1980s England, chronic social deprivation has blighted these pit communities ever since. You don’t need to be aware of these aspects of Durham and its social history to appreciate the insightful success of Cycles of Brass, by Attaya Projects, but it helps if you do. For then you can truly understand how the work chimes so powerfully with the county’s proud brass music tradition, borne out of its diminished, yet indelible mining heritage. You can feel how it resonates throughout the silent, empty mine shafts that lie beneath its troubled pit villages, echoing the spirit of these musical, mining workers. Part of the latest series of commissions for BRASS:Pitch at Durham International Brass Festival, Cycles of Brass, is testimony to the growing curatorial confidence of the Durham County Council Arts Team. Evolving since 2011, BRASS:Pitch sets out to challenge perceptions and understanding of brass music, either through exploring its historical and contemporary social contexts, or expanding the boundaries of the genre by creating new forms of music production. Since launching, festival audiences have been presented with a series of remarkable site responsive commissions, many at the forefront of contemporary, interdisciplinary arts practice, including Cycles of Brass. One of four new works, Cycles of Brass was launched alongside Connections, by John and Karen Topping, a brass plated map that tracked the Brass Band movement in Durham via QR codes; Hjem (Hyem), by Edwin Mingard and Isaac Sakima, a 360° film installation that invited a reflection on those bonds that link youth culture with tradition and Steamsong, by composer John Kefala Kerr, a multimedia opera, inspired by the locomotive Mallard’s record-breaking run in 1938. These three commissions were presented during the festival period (11- 20 July 2014), while Cycles of Brass was still on show in the DLI Art Gallery and Museum until 21 September 2014. Alexander Berman, Lalya Gaye and Filip Strebeyko of Attaya Projects, an interdisciplinary digital media art practice based in Newcastle upon Tyne, form the collaborative team behind Cycles of Brass. Attaya’s strength builds on its international network of artists, designers, scientists and technologists, all committed to delivering innovative, engaging, thought-provoking creative works. 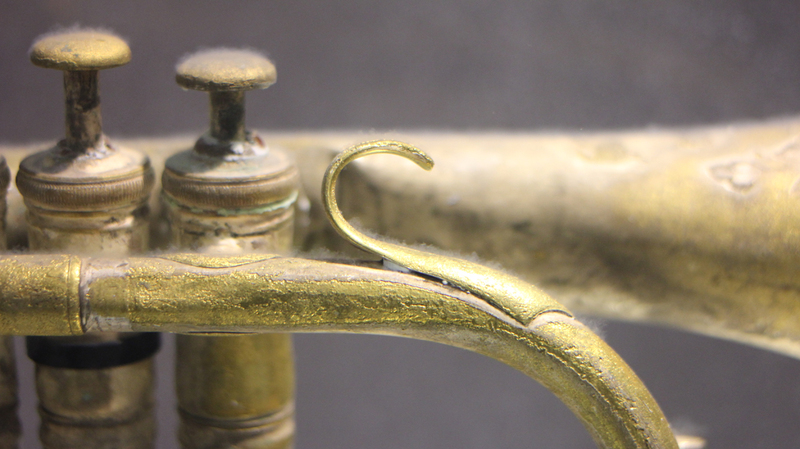 Cycles of Brass is no exception, as it seamlessly glides between art, science, technology and architecture disciplines and concerns. With only Gaye based in the UK, (Berman and Strebeyko are based in Sweden), the trio have, for the most part, collaborated remotely to create this ambitious work. While this is the first time Attaya Projects have collaborated with Strebeyko, Gaye and Berman have been working together since 2008 as part of Dånk! Collective. They met in 2004, when Berman was an art student at and Gaye was doing her PhD at Viktoria Institute in Gothenburg, Sweden, a city well known for its innovative, interdisciplinary arts based universities and institutions. 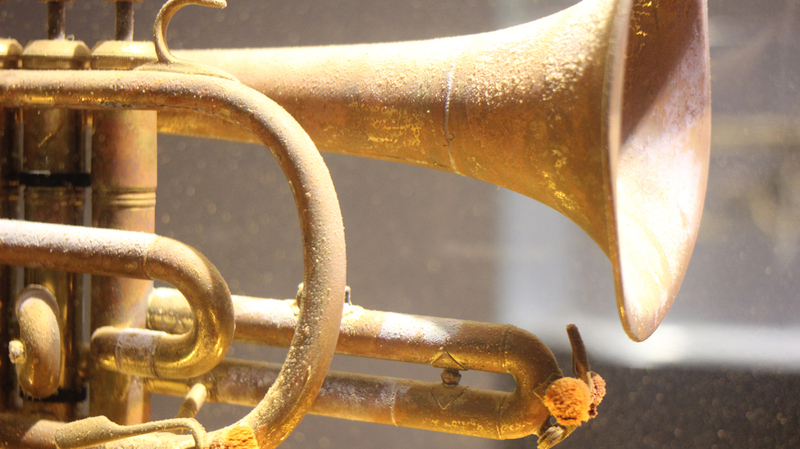 Upon entering the gallery space, on the first floor of the DLI Museum and Gallery, you are at once drawn to this ghostly, meditative installation that eloquently connects Durham’s brass, academic and spiritual cultures. Cycles of Brass presents a contemplative, yet dynamic space that fosters a site for quiet reflection. This approach is reminiscent of another seminal commission for Durham, The Messenger (1986) by video and installation artist Bill Viola, a work equally preoccupied with exploring underwater aesthetic and sound (2). 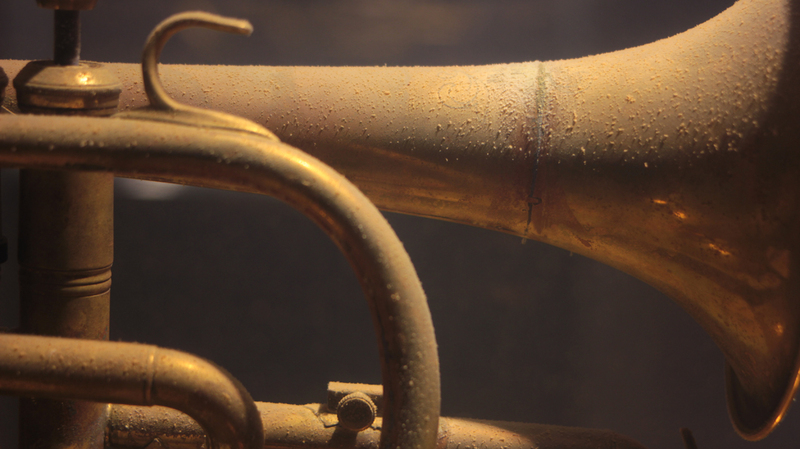 While The Messenger focuses on spiritual messages and universal experiences such as life and death, Cycles of Brass reflects upon the resilience, vulnerability and transient nature of brass music culture throughout history, in particular on how brass culture evolves and reinvents itself. 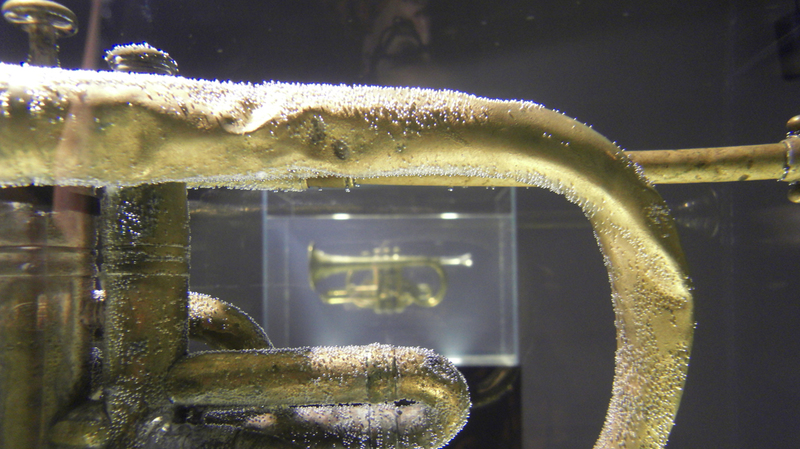 An equally ethereal installation that visually, sonically and metaphorically links these reflections to the physicality of brass – the material that shapes the musical aesthetics and history of brass music. It visualizes the transformative impact of time and context on brass culture, which remains an intrinseque part of the fabric of the local culture of the North East of England, one with a strong impact on local traditions as well as one with periods of transformative transitions. I sat for some time on the leather bench, considering the two formerly discarded brass cornets, which are suspended in separate transparent water tanks and exposed to opposite transformative chemical reactions. Both tanks are filled with water and (safe) chemicals in order to provide condensed conditions in which temporal and environmental impact can happen in an accelerated way. The instruments are exposed to opposite processes: one aging the surface of one instrument, and one restoring the other. One instrument decays progressively while the other is progressively rejuvinated. While my eyes rested upon the slowly yellowing liquid of the left hand cornet, which has been silently, yet rapidly deteriorating since the shows opening in July, my mind wandered back to my first experience of the Durham Miners Gala. Began in 1871, and now the world’s largest trade annual union event, the Durham Miners Gala attracts huge swells of supporters that throng the city streets on the second Saturday in July. The Big Meet (as it is known by the locals) is an annual political event and a social festival. A stirring musical spectacle that showcases the histories, strength and beliefs of Durham’s mining communities. As band after band march through the heart of the city under painted, fluttering banners, followed by hundreds of miners lodge members and their wives, it is impossible not to hear the united voices of village miners that have marched here over the years, as their music reverberates throughout the city streets. I was pulled back to my present by the gentle sound of one of the brass samples that has been triggered randomly and processed sonically by colour changes in the tanks. These tonal changes were being translated into an abstract brass soundscape that changes in parallel with the instruments using sensor technology. A webcam embedded in the plinth senses the visual changes in the surface of the instruments using Processing, and a bespoke sound processing software written in Supercollider generates the soundscape based on changes of sensor values through time. 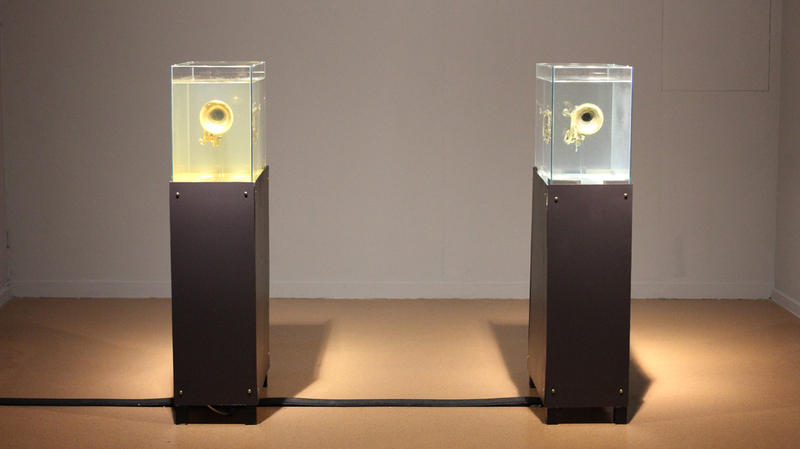 Simultaneously, creating and disclosing an intimate dialogue between the brass cornets, they’re chemical contexts and the technologies acoustic response to their contact. 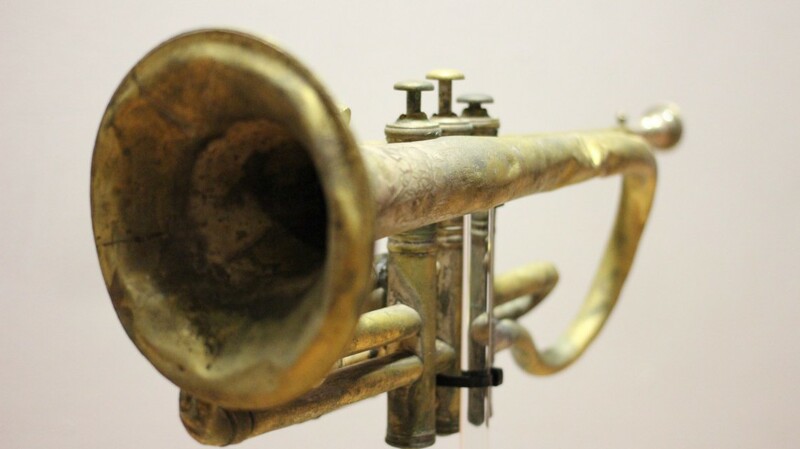 The software uses bespoke samples of brass sounds recorded by two professional brass musicians, Hannabiell Sanders and Magdalena Ågren, one based locally and one based internationally and slowly modifies these sounds over the course of the 3 months of the exhibition. This links the transformation of the instruments to the acoustic realm for which they were created – only now, ‘time’ is the musician playing those once discarded instruments, creating a slowly evolving and meditative soundscape. Attaya Projects have succeeded in creating an abstract yet observable representation of the changes that a culture goes through by focusing on the acoustic physicality of the brass material itself. Yet, they have also managed to transcend materiality, time and context to reveal the enduring energy that resides within our cultures. And just like energy, our cultures will constantly change form, never stay still and cannot be created or destroyed. (1) Bill Bryson, 1996. Notes From a Small Island. New Ed Edition. Bantam Doubleday Dell. (2) The Messenger by Bill Viola was commissioned for Durham Cathedral by the Chaplaincy to the Arts and Recreation in North East England, in 1986. Cycles of Brass is an Attaya Project commissioned by BRASS:Pitch, funded by the Arts Council England and Durham County Council, with support from the Swedish Arts Grants Committee. Lalya Gaye is a Swedish-Senegalese-Malian digital media artist and interaction designer based in Newcastle upon Tyne, UK. She is interested in the poetic and creative space between the physical and the digital, and works primarily with sound, light, metal, interactive technologies, and urban space. Durham County Council Arts Development Team develops and delivers Brass: Durham International Festival. BRASS is an annual celebration of musical culture that takes place across the whole of County Durham. The festival has firmly established a reputation for presenting a diverse and adventurous programme packed with music, spectacular outdoor performances, international collaborations, opera, dance and pioneering community and education work. This vibrant and hugely accessible festival is a testament to the strength of Durham’s brass tradition and the many excellent brass ensembles and bands that County Durham produces. Suzy O’Hara is media arts curator/producer, based in the North East of England. Her practice explores the impact of pervasive, convergent technology and media on the production, dissemination and consumption of art. Suzy is currently undertaking doctoral research supported by CRUMB, University of Sunderland. Her thesis is exploring how collaborations between the creative media and technology industries and the arts are shaping contemporary curatorial practice. Suzy is also curator and producer of Thinking Digital Arts, part of Thinking Digital Conference and Nomadic Salon. For further information on these projects, please follow the links below.